There are many myths about the causes of acne, most surround diet and hygiene. However, neither are accurate. Acne is often caused by the body's increased production of the hormone Androgen, which stimulates the sebaceous glands to produce more oil. The increased oil causes the pores to become blocked. The Bacteria then feeds on this oil, as the bacteria multiply, waste products and Sebacic Acid is created and irritates the sebaceous gland, which becomes inflamed causing a blackhead, pimple or nodule. The light targets the porphyrins produced by the bacteria that cause acne, destruction of these porphyrins will produce free oxygen radicals and a bactericidal effect is induced to reduce the acne infection by killing the bacteria. The light is also absorbed by the blood vessels that supply the sebaceous glands , by heating up the capillaries this reduces the blood flow to the sebaceous glands decreasing the over production of oil that leads to acne. The heat reaction produced will also stimulate collagen production to increase healing of the acne lesions and may even soften the appearance of scarring. Tolerance of pain is different for each person. The majority of clients describe the feeling as a warming sensation rather than pain, similar to the feeling you have after a day on the beach. After treatments you may find it comforting to cool the skin with 100% pure Aloe Vera gel. You may notice some general redness on the face which will disappear in 1-2 days and following the treatment pigmented areas may appear darker and eventually disappear. Crusting can also be found and can last up to 7-10 days. Because the bacteria is difficult to eradicate completely, your doctor will probably recommend that you continue using adaplene cream or gel some months after the treatment has ended. A course of 4 treatments is recommended with 2 – 3 week / 4 week intervals. This routine can be repeated again to achieve further results if necessary or at longer intervals for maintenance. The Ellipse acne treatment is a combination therapy. We recommend you use adapalene (Differin or Redap) cream or gel. One month prior to treatment a skin care routine of glycol acid, AHA’s or a retinol based cream should be started. An exfoliating facial one week prior to treatment can also be helpful. A professional complementary skin care range should be used to maintain the best results. Avoid tanning (sun, solarium or self-tanning cream) 30-60 days before and during the treatment period. Tanned skin will absorb more light which will make the treatment more painful and will put you at risk of burning. People with sensitive skin may benefit from using 100% pure Aloe Vera Gel for a few days after treatment. We recommend you limit sun exposure and use a sunscreen (SPF 60) for a few weeks following treatment. 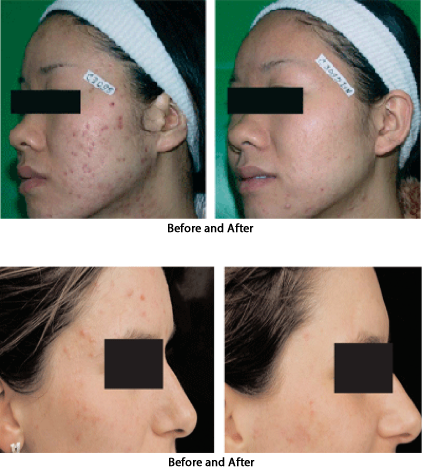 The cost of the Ellipse IPL Acne treatment is dependant on the area treated. Generally prices start from £150 per session. Please do not hesitate to contact the clinic for more pricing options.